Boise City Hall is located at 150 North Capitol Boulevard, Boise City, ID 83701; phone: 208-384-3830. Photo: The Alexander House, ca. 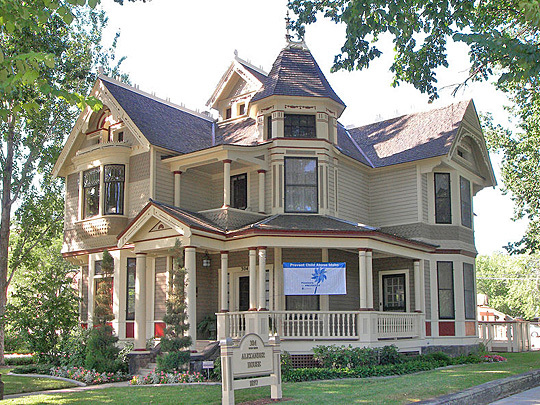 1897, 304 W. State St, Boise, ID. Listed on National Register of Historic Places in 1972. Photographed by Larry. D. Moore, 2009, (own work) [cc-by-3.0 (creativecommons.org/licenses/by/3.0)], via Wikimedia Commons, accessed September, 2012. The birth of Boise was coincident with the historic gold rush of 1862, when it was told with baited breath that the yellow metal, in quantities exceeding the wildest dreams of the prospector, had been found in the mountain fastness of Southern Idaho. Idaho City, about 36 miles from Boise, was established, and in 1864, only 2 years later, had a voting population of 16,000. In 8 years the camp produced approximately $200 million in placer gold. In 1863 Fort Boise was established on the Boise River, and in the same year, Boise City, then with a population of 3,000, was made the capital of the State, and attained thereby, some degree of public attention. The early years of its existence were full of uncertainties and struggles that characterize the development of every community in a new land. But, surmounting all obstacles, full of faith in the future, believing in themselves and in the glorious region which had been given them as a rich heritage, these sturdy pioneers built well the firm foundation of the city. The growth of Boise was slow for many years, owing to the fact that many of the people who came to Boise did not intend to remain, The idea seemed to be, as it was in so many new towns, that they would make some money and return to their old homes. Among the first who built and started in business was J. D. Agnew and H. C. Riggs. These men built an adobe house on the northeast corner of Main and Seventh Streets, where they opened a saloon and had a feed and livery stable in the rear of the building. In December, 1864, the second session of the legislature assembled at Lewiston and passed an act locating the capital permanently at Boise City in Boise County. The act was approved December 7, 1864. In the same month, the legislature passed an act dividing Boise County and creating Ada County and locating the county seat at Boise City. This act was approved December 22, 1864. This encouraged residents and a number of businesses were soon built: hotels, shops and saloons as well as residences. The farmers also seemed to take new courage and began work in earnest to improve their farms and make homes for their families. Boise Idaho, published by the Boise Commercial Club, ca. 1908. John Hailey, The History of Idaho, Press of the Syms-York Company, Boise, 1910.